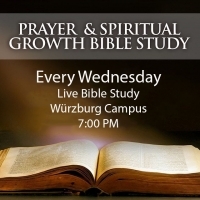 Join us for Wednesday Night Bible Study in Würzburg. The class is taught in German and English translation is available if needed. We cover a variety of topics that will encourge and challenge you to have a closer relationship with our Lord.